There were many surprizes in Dubai (Dubai itself is a pleasant surprize, with prevailing peace, perpetual development, new constructions, creations of islands) including the 12th edition of Art Dubai. Held from 21st to 24th March 2018, it included 105 galleries from 48 countries, with some participating for the first time, like Kazakhstan and Ethiopia. Surprises were not limited to two halls of ‘Contemporary’section in Art Dubai, but in the ‘Modern’ section too there were a few. Here one came across an early canvas of ZahoorulAkhlaq at the Grosvenor Gallery booth. A stylized bull in thick strokes, an imagery completely different from his signature style. The painting (discovered at someone’s place in Cambridge by chance) revealed the link of an artist with his mentor and teacher, Shakir Ali who drew bull frequently, and his students followed this symbol, some as a formal element while others on a conceptual level. Artists are not only inspired from their tutors, but from their contemporaries as well, or at least their work bears resemblance to their fellow practitioners.The connection among artists was highlighted in an exhibition ‘That Feverish Leap into Fierceness of Life: A look at five artist groups in five Arab cities across five decades’. Works of artists based in Cairo, Baghdad, Casablanca, Khartoum, and Riyadh reminded (especially from 60’s and 70’s) of their contemporaries, for example the painters of ‘Lahore Art Circle’ (active during the same period). The exhibition, curated by Sam Bardaouil and Till Fellrath, had its genesis in the quote “If we fail to fulfil ourselves through art, as through all other realms of thought, we won’t be able to make that feverish leap into the fierceness of life” (Manifesto of the Baghdad Group of Modern Art 1951). It became a significant document to study formal, conceptual and cultural approaches of artists, who in relation to ‘West’ sought to search a local idiom – apparently rooted in the genre of ‘naïve’ art, as majority of the artists identified with ‘vernacular’ purity and primitive-ness of expression. Somehow lately the fascination ofheritagehas become part of heritage. Time is changing in great speed, hence “tradition is an illusion of permanence” (Woody Allen). World has moved in many directions. Due to split and spread of economic centers and information resources, there is no singular center of art any more. This was sensed in the ‘Modern’ section,where Grosvenor Gallery London displayed Pakistani artists such as Rasheed Araeen, ZahoorulAkhlaq, Ismail Gulgee, Ahmed Parvez, Sadequain and Anwar Jalal Shemza, with some of the most unusual works on view. All these works mapped the artists’ attempts toward creating ‘parallel moernities’, separate from, though linked with the mainstream western art. Like these examples, ‘Contemporary’ section of Art Dubai illustrated the aspect of being local and universal, simultaneously; with galleries across the world and artists of various nations showing side by side in the fair. This year two galleries from Karachi had their booths of single artists (MuzzamilRuheel at Canvas Gallery, and Muhammad Zeeshan at Sanat Gallery). 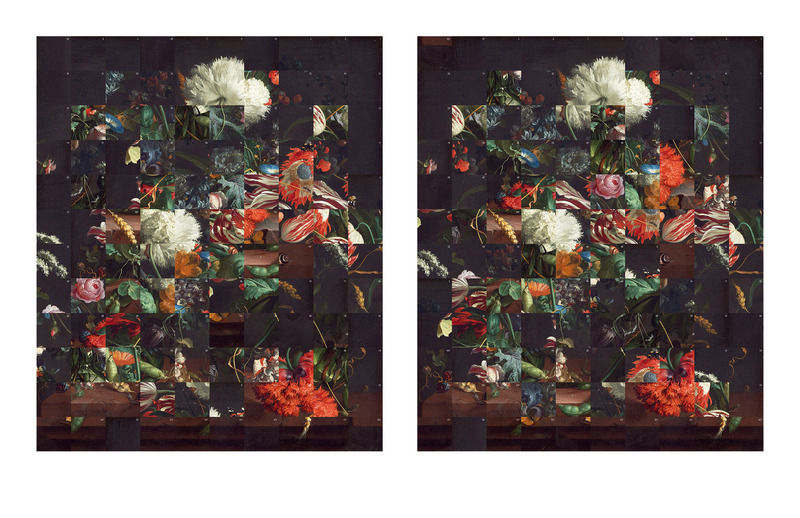 Ruheel showed “a body of work that talks about the pauses; the time between two words or sentences.” The artist’s interest in language, and its opposite – silence – was evident in the manner he composed his imagery in shades of dark letters. Zeeshan on the other hand “addresses the construct of originality. Or the fascination with authenticity, that becomes a fetish”. 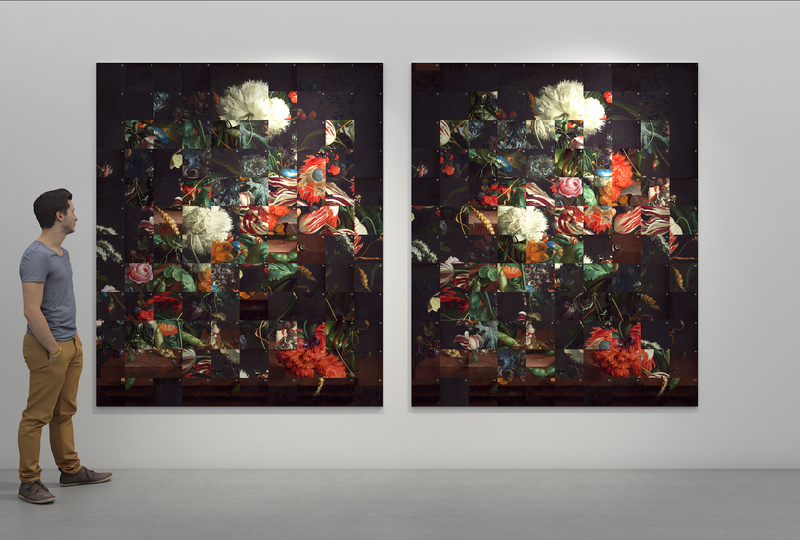 At his display area, pieces identical to each other were described as copies – from first to third – but despite being the same, these were priced differently, critiquing the craziness of art marketthat promotes consumerist culture. The work commented on the obsession with differentiating or distinguishing ‘real’ from ‘fake’ as the main anvil of aesthetics; instead of enjoying images, reading ideas or recognizing concerns in artworks. Rashid Rana has been analysing the notion of originality and authenticity in his work through his highly sophisticated imagery that embodies many aspects of our socio-political existence. Identity, tradition, shifting fabric of society are a few elements found in the art of Rana. 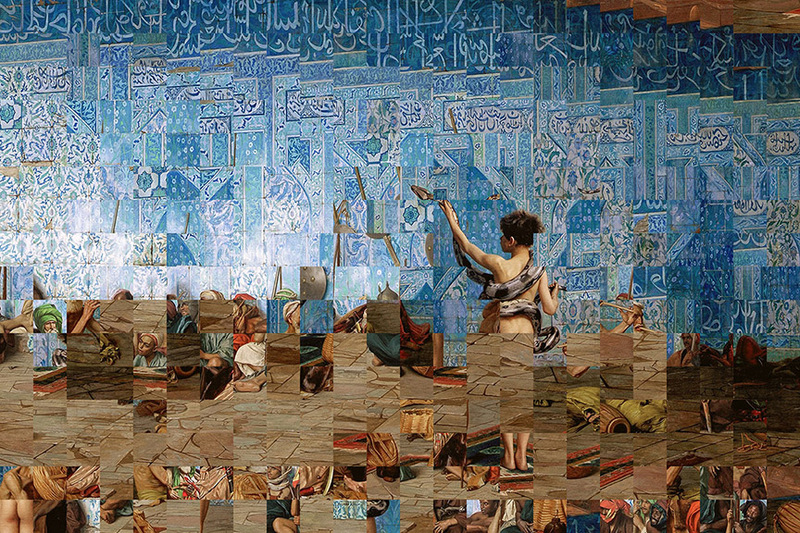 In his recent works, he commented on the history/practice of Orientalism by dismantling paintings with typical orientalist theme. Interestingly the work (at Leila Heller Gallery booth) challenged the convention of ‘painting’ since it’s medium was digital. In the work, the artist deconstructed the edifices of heritage on various levels. 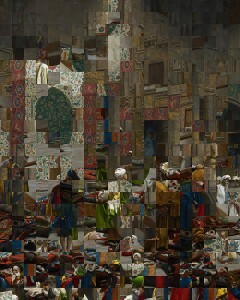 A number of other artists at Art Dubai, have been approaching the history of image making in different schemes. Aisha Khalid’s works at Zilberman Gallery showcased the artist’s sense of space by manipulating the possibilities of geometry. Like her, infinity of space was also aimed in the work of Waqas Khan (at GalerieKrinzinger booth). Small work on paper due to its intricate marks and pictorial effect engaged a spectator who was entangled in the web of tiny marks. GalerieKrinzingerdisplayed some big names in present art world, like Marina Abramovic, MahaMalluh, and Sudarshan Shetty. Shetty has been reflecting on tradition in a sophisticate pictorial diction. He selected a broken china and added its form joining the rest made in wood. At the Leila Heller Gallery, Shetty’s wooden carpet was carved in detail and with its corner slightly turned – like a woollen rug – could be seen a means to transform tradition for its political, cultural and commercial reasons. There are many traditions, physical, ephemeral, pictorial, literary etc. Hamra Abbas, taking the story of flying carpet, a recurring motif in the Thousand and One Nights (the literary text composed in Arab regions) created a work that connected to flying carpet. 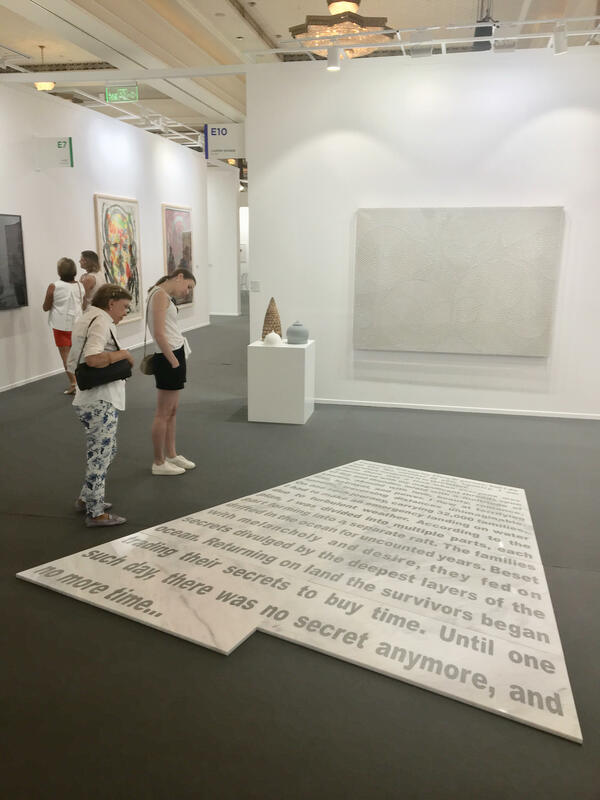 Displayed at Lawrie Shabibi booth, the text based work in marble (‘Please Do Not Step: Loss of a Magnificent Story’ 2017),) was placed at the exhibition floor, with visitors walking on it. In her text “References include a flying carpet personified, its possible transformation into an aeroplane and the scattering of migrants around the world’s oceans. The shape of the text block recalls that of a magic carpet zooming into space”. Another artist from Pakistan, Abdullah M. I. Syed (who in past created flying carpet installation) invoked the link between art and money, by using dollar bills as the material to compose his geometric forms. For a number of years Syed has been utilizing currency notes to construct his works on paper, installation and performance, and current works at the Aicon Gallery were part of same sensibility/style. The artist, who approached tradition to liberate it from a fixed culture/location, Anish Kapoor was displayed at Galleria Continua along with Ai Weiwei, Michelangelo Pistoletto, Ahmed Mater, Daniel Buren and several other celebrities of contemporary art. Kapoor’s large disk with deep blue enthralled a spectator due to its illusion of deep space. Both the circular form and pigment invoked Indian popular pictorial practice, but stripping it from an easily identifiable address or interpretation, the work contained a sensory experience (reminding of Peruvian poet Augusto Lunel’s first line of Manifesto: “We are against all laws, starting with the law of gravity”). The sculpture of Ai Weiwei, an entangled wooden handcuff, suggested the distance between openness and captivity, difference between freedom and restrictions; situations, rather conditions one has to face surviving in countries with political turmoil and state repressions in various guises. The political turmoil, a familiar scenario in countries once categorized third world, effects artists in multiple patterns. 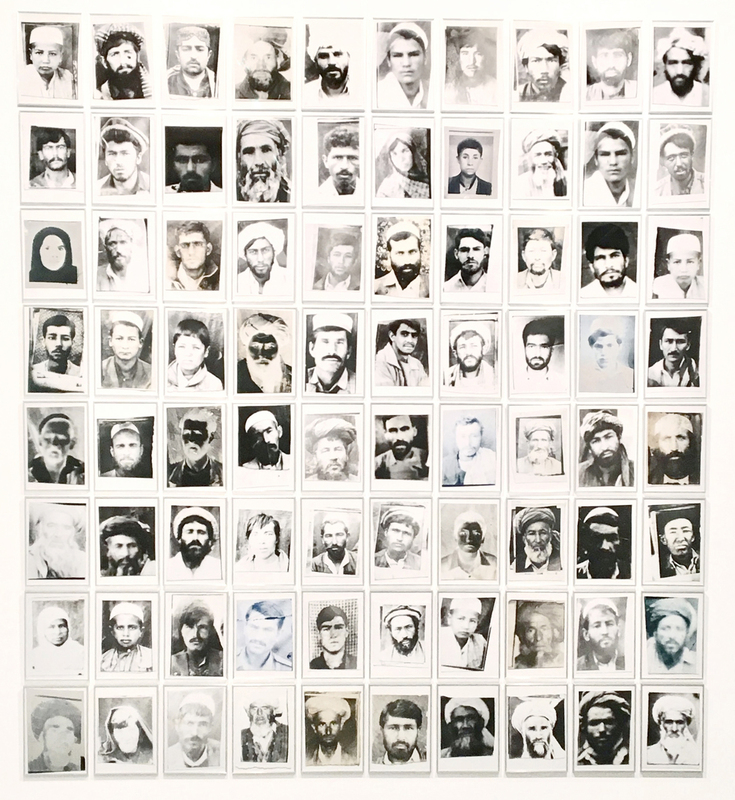 At Giorgio Persano Gallery booth, Afghan artist Lida Abdul recreated and recalled the conditions of her country that witnessed – and still suffering war (both internal and external). Through the work, consisting of 80 framed photos of people from her country, initially “belonging to an Afghan passport photographer”, she communicated how “war affects the expression of men, women and children over a span of twenty years”. With Pablo de Val as the artistic director of Art Dubai 2018, the fair disclosed the importance of having a venue that is local, yet international; expanding and including diverse practices and different projects. This year a new section ‘Residents’ was added, along with regular features, such as Abraaj Group Art Prize, with the exhibition of short listed artists Myriam Ben Salah, BasmaAlsharif, Ali Cherri, Neil Beloufa and the winner Lawrence Abu Hamdan. One is not sure about the literal meaning of Abraaj, but the Arabic term seems closer to another Arabic word, burj (tower). It also sounds similar to bridge, logically, because Art Dubai18 was a means of making bridges between art practices, creative ideas, and national identities.